Artist’s concept of the environment around the supermassive black hole at the center of Mrk 231. The broad outflow seen in the Gemini data is shown as the fan-shaped wedge at the top of the accretion disk around the black hole. The total amount of material entrained in the outflow is at least 400 times the mass of the sun per year. Supermassive black holes are a bit like the Cookie Monster, gobbling up grub so greedily that they fling away huge amounts of perfectly good "food," a new study suggests. Researchers studying a faraway galaxy have detected a huge amount of gas and dust spewing from the supermassive black hole at its core. This flood of material is so large that it's depriving the black hole of the food it needs to continue growing — and it's limiting the galaxy's ability to churn out new stars, researchers said. The astronomers used Hawaii's Gemini Observatory to study a galaxy called Markarian 231 (Mrk 231 for short). Mrk 231 is about 600 million light-years from Earth, in the direction of the constellation Ursa Major (the Great Bear). Some estimates indicate that Mrk 231 has a mass about three times that of our own Milky Way galaxy. Mrk 231's central black hole is thought to have the equivalent of ten million solar masses — about three times that of the supermassive black hole at the heart of the Milky Way, researchers said. Mrk 231 is in the final stages of a violent merger with another galaxy, researchers said, and is currently gobbling up dust and gas so voraciously that it is spawning a powerful quasar. 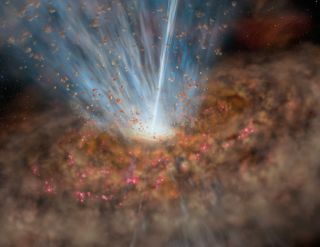 Quasars — huge outflows of radiation from galactic black holes like Mrk 231's — are some of the brightest objects in the universe. The new Gemini observations reveal the power of the black hole's appetite. Researchers detected gas and dust streaming from the galactic core for at least 8,000 light-years in all directions. This material is rocketing outward at more than 2.2 million mph (3.5 million kph) — accelerated by the immense power of the quasar. The researchers will report their findings in the March 10 issue of the journal The Astrophysical Journal Letters. The massive outflow is removing gas from Mrk 231's inner regions incredibly quickly — more than 2.5 times as fast as stars can form, researchers said. And that has big consequences for the galaxy's evolution. With less raw material lying around, the quasar will blink out soon enough, and star-formation activity will draw to a close. Eventually, Mrk 231 will consist of nothing but old and aging stars, becoming a "red and dead" galaxy (so named because of how it will look through a telescope). As extreme as Mrk 231’s eating habits may be, they're probably not unique. And neither is the galaxy's fate. "When we look deep into space and back in time, quasars like this one are seen in large numbers, and all of them may have gone through shedding events like the one we are witnessing in Mrk 231," Veilleux said.